The outcome of this war will no doubt be decided in Europe, but the conflict nevertheless stretches its tentacles further afield. By now Germany’s overseas colonies have mostly been overrun, but in German East Africa Lettow-Vorbeck still flies the flag for the Kaiser, despite his isolation from the Fatherland and the much larger forces the British Empire is deploying against him. Lettow-Vorbeck’s army is mostly composed of locally recruited African troops, with a small number of white German officers in command. At this stage his main goal is not to defeat his enemies but to keep his army in the field, thereby preventing the Allies from transferring the troops he is fighting to the Western Front. The armies deployed in East Africa are tiny compared to those seen in Europe. The casualties they suffer in combat are insignificant in comparison to those seen at Verdun or Passchendaele. But this is not some kind of clean war devoid of human suffering. For the native population of German East Africa, this war has been an utter disaster. Lettow-Vorbeck is keeping his army in the field by confiscating the food supplies of the local civilian population. As a result, famine and pestilence stalk the land. Some 300,000 people have died from the famine since the war’s start, roughly 5% of the colony’s pre-war population. Lettow-Vorbeck is not just taking the people’s food: he is also taking their men. Some of these are press-ganged into his army to make up the numbers lost in the fighting, but more are seized as labourers. The poor roads and the vulnerability of horses to the Tsetse fly mean that men make the best carriers of an army’s essentials. The British too are press-ganging a vast number of labourers from their colonies to serve in East Africa. Like the Germans, the British are treating these labourers effectively as slaves. They are also underfeeding them relative to their African soldiers, with the result that the labourers are severely malnourished and thereby vulnerable to disease. The African labourers pressed into service by the British have a higher mortality rate than infantrymen serving on the Western Front. 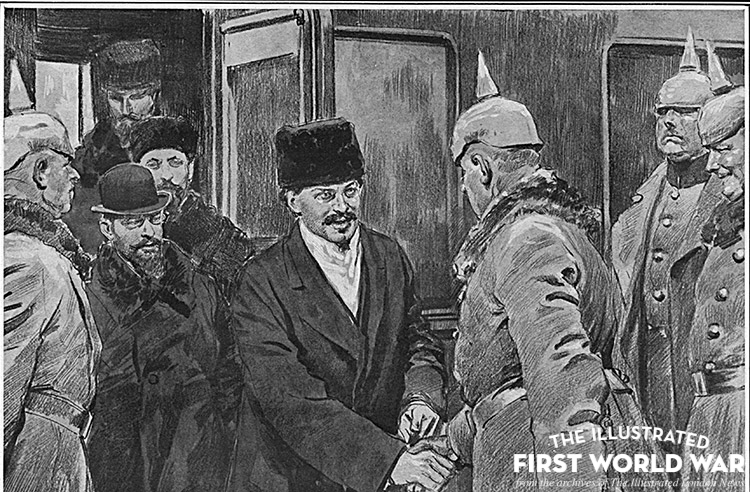 The war against Turkey had gone well for Russia, but now the Bolsheviks have signed an armistice with the Turks, agreeing to return their gains since the war’s start. Russian forces are now withdrawing from the former frontline. The situation is becoming chaotic as the Russian army disintegrates, leaving a power vacuum in the countryside. In the Black Sea port of Trebizond (also known as Trabzon), Russian troops are out of control, defying their officers to either commandeer ships to bring themselves home or engaging in riotous bacchanalia. 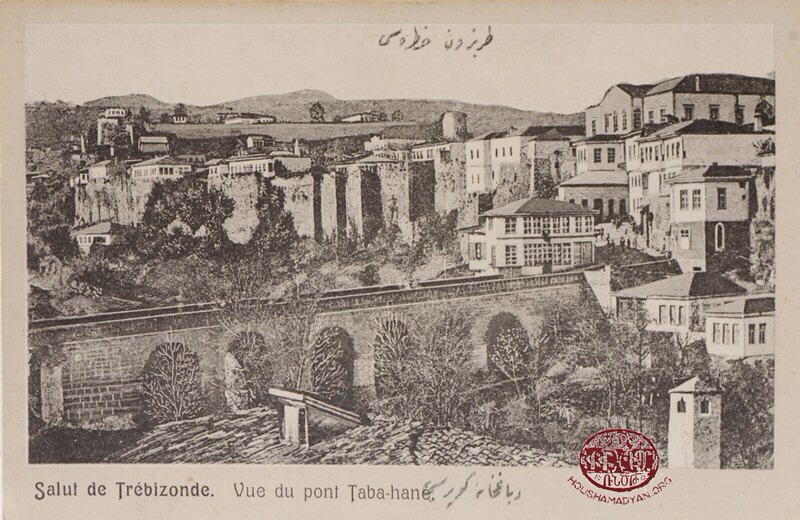 The Russian army commanders in Trebizond declare martial law in an attempt to bring the disorders to an end, but the effort is futile; they no longer have any means with which to enforce their authority. Germany and Austria-Hungary have had a good year on the battlefield, effectively knocking Russia out of the war and crippling Italy while Germany repelled enemy attacks on the Western Front. At home though things are more problematic. The British blockade and the wartime decline in agricultural production have led to food shortages. In Germany no one is starving as such, but civilian mortality rates are around a third higher than in peace time. Because food is being funnelled to the army and to workers in war industries, those deemed surplus to the war effort are getting the least to eat and so are vulnerable to illness and malnutrition. The situation is worse in Austria-Hungary. The railway network is less extensive, making it harder to transport food to where it is needed, and the authorities have been less successful at organising an effective distribution of food. Agricultural Hungary has also restricted the transfer of food to the industrial regions of Austria. Large numbers of people are going hungry and actual starvation is a real threat to the urban poor. Germany’s U-boat campaign was meant to bring the war to a victorious end but instead it has brought the USA into the war against the Central Powers. The leaders of Germany and Austria-Hungary fear the indefinite continuation of the war will lead to revolution. Emperor Karl of Austria-Hungary wants an immediate peace on whatever terms he can get, but Ludendorff in Germany is determined that any peace must be a victorious one. He is preparing for a spring offensive on the Western Front, gambling that he can knock Britain and France out of the war before the Americans arrive in strength. Then Germany will not have to face another hunger winter. The Germans and Russians are conducting peace-talks at Brest-Litovsk. 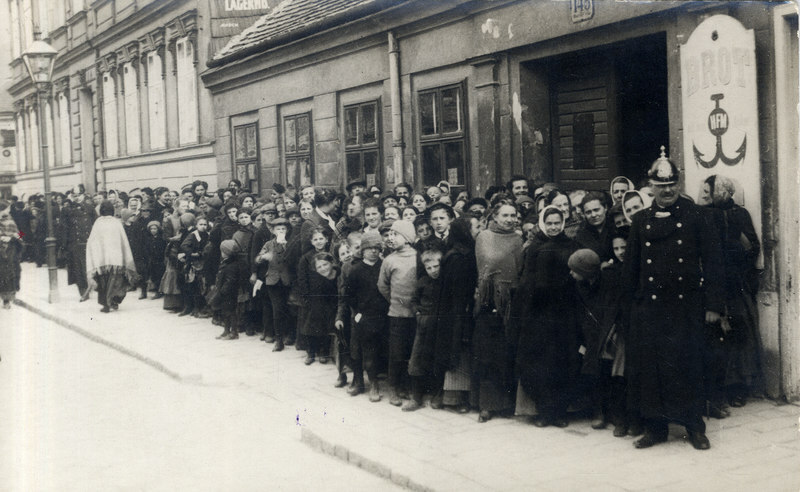 The Germans are eager to conclude a settlement as quickly as possible so that they can redeploy their Eastern Front armies to the West. The Russian delegates are in less of a hurry. Because of the imbalance between the two powers, they know that any final peace terms will be harsh and are seeking to put off the day of reckoning. They also hope that if they play for time then revolution will spread across Europe, bringing the war to an end and ushering in an era of socialist peace. While the German delegation is comprised of career diplomats and military officials, the Russians are a much more motley crew. Led by Bolsheviks catapulted to prominence by their seizure of power, the delegation also includes representatives of a cross-section of Russian society: soldiers, sailors, women, and industrial workers. The Bolsheviks had initially forgotten to include a peasant in their party, but on their way to the talks they picked one up from the streets of Petrograd. The rustic manners of this Roman Stashkov have charmed his German counterparts, who are particularly amused when he is asked at a formal dinner whether he wants red or white wine and replies “which is stronger?”. Trotsky has taken over as head of the Russian delegation, his rhetorical flights of fancy ideally suited to the task of preventing the talks reaching any definite conclusion. Kühlmann, the German foreign minister, seems only too happy to oblige. The two men spend their time discussing Marxist philosophy and abstract points of principle, much to the chagrin of Ludendorff and Hindenburg, who want the talks concluded as quickly as possible. Trotsky cannot however keep the talks in the lofty realm of abstraction indefinitely. When discussion turns to the post-war borders between Russia and Germany, he is on much shakier ground. The Bolsheviks have called for a peace without annexations or indemnities, but the Germans are determined to hang onto their gains in the east. Talks now break down on this point. But again, to the German high command this looks like another of Trotsky’s delaying tactics. Note: Roman Stashkov’s bizarre adventure is worth reading about in detail. The first edition of Orlando Figes’ A People’s Tragedy covers it on pages 540 to 541. If you do not have that to hand, a useful summary is included here. Stashkov was originally brought along to the negotiations that led to an armistice on the Eastern Front and may have been sent home by the time the full negotiations on a peace treaty were taking place. The Bolsheviks are becoming more entrenched in power in Russia. Sovnarkom, their government, is meant to ruling on behalf of the Soviet Executive (which in turn represents the All-Russian Soviet Congress). However Sovnarkom has declared itself empowered to rule by decree and is presenting legislation to the Soviet Executive for approval only after the fact. Today the Soviet Executive meets for the first time in two weeks, now completely marginalised from real decision making. Perhaps in an effort to hide the Bolsheviks’ authoritarian tendencies, the left faction of the Socialist Revolutionaries is now brought into Sovnarkom. The Left SRs were the only significant other party to back the Bolsheviks’ seizure of power, for all that their instincts incline them towards a more decentralised and non-hierarchical vision of socialism. They hope that by joining Sovnarkom they will be able to moderate the Bolsheviks. To Lenin though they are simply useful idiots, thrown a few unimportant ministries to lend Sovnarkom a less dictatorial air. Real power remains with the Bolsheviks. Picture captioned by Wikipedia, left to right: Isaac Steinberg (Left SR), Ivan Skvortsov-Stepanov (Bolshevik), Boris Kamkov (Left SR), Vladimir Bonch-Bruyevich (Bolshevik), V. E. Trotsky (unknown), Alexander Shlyapnikov (Bolshevik), P. P. Proshyan (unknown), Lenin (Bolshevik), Stalin (Bolshevik), Alexandra Kollontai (Bolshevik), Pavel Dybenko (Bolshevik), E. K. Kosharova (unknown), Nikolai Podvoisky (Bolshevik), Nikolai Gorbunov (Bolshevik), V. I. Nevsky (unknown), Alexander Shotman (unknown), Georgy Chicherin (Bolshevik). I am unsure as to whether V. E. Trotsky is meant to be Leon Trotsky or if it is another person with the same surname; it does not look obviously like the more famous Trotsky. I am also curious about Ms Kosharova, about whom I can find no information, unlike the more famous Ms Kollontai, one of the first women in the modern world to head a government ministry. At Brest-Litovsk German and Russian delegates are attempting to negotiate a settlement that will bring a final end to the war between the two countries. The Germans are representatives of the Kaiser‘s imperial government, which effectively means that they are the agents of Hindenburg and Ludendorff; the Russians have been sent by Sovnarkom, the Soviet government of Lenin‘s Bolsheviks. The Germans hope that peace with Russia will allow them to send large numbers of troops to the Western Front; they also hope to seize territory and extract resources from the Russians. The Russian delegates however are playing for time, hoping to spin out negotiations until revolution spreads to the other belligerent nations of Europe. They try to advance the revolutionary agenda by making lofty calls for a peace based on no annexations and no indemnities and call for an immediate ceasefire on all fronts in Europe. At home meanwhile there are signs that the Soviet government in Petrograd may soon have to fight for its survival. Fighting has broken out in the southern Russian city of Rostov, where Bolshevik forces are under attack from the newly formed Volunteer Army, led by Generals Kornilov and Alexeev. This force is top heavy, with a surfeit of officers, and greatly outnumbered by the pro-Bolshevik forces in Rostov. However the military discipline of the Volunteers means that they have the upper hand in the fighting, a worrying portent for the Bolsheviks if this fighting spreads. Germany’s Luckner had been imprisoned by the New Zealanders after his ship, the Seeadler was accidentally sunk. But a few days ago he busted loose, commandeering a small boat and setting sail to the Kermadec Islands, where he hoped to seize a larger ship and resume his raiding operations against Allied shipping. Unfortunately for him, the New Zealanders guess his destination; as he approaches the Kermadecs he is intercepted by a New Zealand warship and obliged to surrender. As he is returned to captivity it appears that now Luckner’s war really is over.